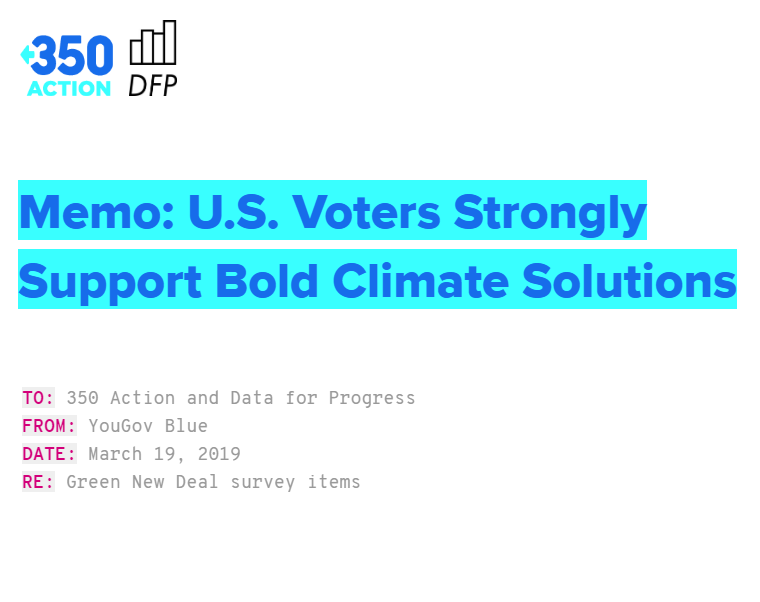 On behalf of 350 Action and Data for Progress, YouGov Blue fielded an online survey of US voters from March 3, 2019-March 11, 2019. This survey is based on 1,025 interviews conducted by YouGov on the Internet on the population of self-identified voters. The sample was weighted according to gender, age, race, education, and Census region based on registered voters in the November 2016 Current Population Survey, conducted by the U.S. Bureau of the Census. Respondents were selected from YouGov's panel to be representative of registered voters. The weights range from 0.33 to 4.4 with a mean of 1 and a standard deviation of 0.51. This memo focuses on the results of three items related to the Green New Deal, federal climate policy and the influence of fossil fuel money in politics. The first is concerned with a policy known as “keep it in the ground,” designed to phase out fossil fuels, which are the primary drivers of climate change. The second is concerned with the creation of jobs through clean-energy investments in American communities and infrastructure. The third is concerned with a pledge candidates for office in the United States might sign to reject campaign contributions from fossil fuel corporations, which have a vested interest in stopping or curtailing climate action. ➔ The Green New Deal remains broadly popular, with 59 percent of US voters supporting the policy and only 28 percent opposed. ➔ While support for green energy policies is strongest among Millennials, age is not as strong a divider of opinion as one might suspect. ➔ Party ID is the central cleavage on green policy, with Democrats supporting climate action at much higher levels than Republicans, and Independents leaning closer to Democrats than Republicans on all three issues. ◂ Would you support or oppose policies designed to prevent pollution and climate change by prohibiting new fossil fuel plants and pipelines when there are clean, renewable alternatives available? Respondents could report whether they strongly agreed, somewhat agreed, neither agreed nor disagreed, somewhat disagreed, strongly disagreed, or did not know. The order of the responses was rotated so that respondents randomly saw a “strongly support” through “strongly oppose”, or a “strongly oppose” through “strongly support” ordering of response options. The text of the question was also rotated so that respondents saw either “Would you support or oppose...” or “Would you oppose or support…” phrasing. All three items used random rotations. Millennials are significantly more supportive of the policy than are voters of other generations, while older respondents are roughly equally supportive of the policy. Fully 66 percent of Millennial voters support “keep it in the ground,” as do 52 percent of Generation X, 51 percent of Baby Boomers, and 51 percent of the Silent Generation. The policy of “Keep it in the ground” enjoys support of 76 percent of Democrats and 59 percent of Independents. However, just 24 percent of Republicans support the policy. Almost as many Republicans, 22 percent, were undecided or unsure how they felt about the policy, compared with 16 percent of Independents and 17 percent of Democrats. ◂ Would you support or oppose a Green New Deal, a policy in which the Federal government creates jobs and invests in low-income communities building energy efficient infrastructure, replacing lead water pipes, and updating America's energy grid? Respondents could report whether they strongly agreed, somewhat agreed, neither agreed nor disagreed, somewhat disagreed, strongly disagreed, or did not know. The Green New Deal has moved over the past election cycle from an incipient broad-brushstroke policy to one of the most contentious terms in national politics. The Green New Deal has been championed by major progressive legislators like Alexandria Ocasio-Cortez and attacked by Republicans up to and including Donald Trump, most vociferously in the early rollout of the proposal. Despite this, we find clear continued support for the Green New Deal. Fully 59 percent of voters somewhat or strongly support the policy while just 28 percent somewhat or strongly oppose it. Unlike previous surveys, the share of voters with no opinion has begun to decline, with just 12 percent unsure or without an opinion about the Green New Deal. Though the difference is within the survey margin of error, support for the Green New Deal is slightly higher among Republicans than is support for “keep it in the ground,” with about 28 percent of Republican voters reporting somewhat or strong support for the Green New Deal. Independents generally side with Democrats, with 60 percent supporting the policy and just 29 percent opposed. Democrats are highly supportive of the Green New Deal, with 87 percent of respondents expressing support while just 5 percent are opposed. Millennial respondents were most supportive of the Green New Deal, but the differences in support for the policy between generations generally fell within the margin of error. Fully 64 percent of Millennials supported the Green New Deal, as did 61 percent of Generation X, 54 percent of Baby Boomers, and 59 percent of the Silent Generation. ◂ Would you support or oppose your Congressional representatives signing a pledge to refuse campaign contributions from fossil fuel PACs? Respondents could report whether they strongly agreed, somewhat agreed, neither agreed nor disagreed, somewhat disagreed, strongly disagreed, or did not know. Unlike the Green New Deal and unlike “keep it in the ground,” this item taps into a less prominent idea in the national discussion about climate change. While it is generally known that Republican legislators are more supportive of fossil fuel corporations than Democratic legislators, the notion of refusing campaign contributions from industry is less polarized. There is significant room for movement on this issue. While fully 49 percent of voters support such a pledge and just 19 percent oppose it, 32 percent of voters are either undecided or unsure about such a pledge. The uncertainty, however, is slightly driven by Republicans. While 30 percent of Democrats and 30 percent of Independents are undecided or unsure about such a pledge, 39 percent of Republicans either have no opinion or are undecided about their representatives signing a pledge not to take fossil fuel PAC money. Consequently, this is the environmental issue Republicans are closest to parity on of the three asked here, with Republican respondents opposing such a pledge just 34 percent. There is little difference across generation in support for such a pledge. Fully 52 percent of Millennials, 46 percent of Generation X, 50 percent of Baby Boomers, and 52 percent of the Silent Generation would somewhat or strongly support a pledge not to take contributions from fossil fuel industry PACs. Republican attacks on the Green New Deal have failed to undermine a strong base of support for policies that would transition the US economy from fossil fuels to clean energy sources and drive job-creating investments in infrastructure and communities. There is significant room for movement among Republicans on environmental and energy issues, particularly the no fossil fuel money pledge, providing a possible way forward for lawmakers and advocates. This is slightly different from the current Pew Research Center in that voters under the age of 22 are currently classified as “Generation Z” voters, but the sample size of our Millennial respondents is too small to further divide into Millennial and Generation Z.